District Chief Executive for Gomoa Central, Hon. Benjamin Kojo Otoo has said that 'Ghana Beyond Aid' mantra is not just a slogan but meant to propel Ghanaians into the frame of mind that would quicken the pace of development. In an address he delivered at the 7th Congregation of Perez University College at Gomoa Pomadze in the Gomoa Central District of the Central Region last Saturday, under the theme; Ghana Beyond Aid, the role of Private Tertiary Education, the DCE called on all hands to be on deck to make 'Ghana Beyond Aid' mantra succeed.
" Mr. Chairman, permit me to quote His Excellency Nana Addo Dankwa Akufo Addo, President of the Republic of Ghana " We do not want to remain the beggars of the World, we do not want to be dependent on Charity. We can and we should be able to build a Ghana with the use of her own resources and proper management as a way to engineer social and economic growth in our country" unquote. In as much as the government is putting structures, measures, and policies in place to make us less dependent on foreign aids and grants for survival, other sectors of the economy including the educational sector has a major role to play to realize this vision. The Private Tertiary Institutions have the responsibility of grooming the nation's human capital and must adhere to the quality standard and develop a rich curriculum with clear intent and also devise effective teaching methods to empower students to be competent and functional in their various fields of study and places of work"
Hon. Benjamin Kojo Otoo further stated " Today, we are in the global world, and our graduate should be able to compete with other graduates of developed countries. This can be possible when the leadership of Private Tertiary Institutions increase research and require their staff to publish more articles and findings. As we know, most reliable researches and policy reviews have largely been produced by the Universities. This will help to build the productive capabilities of citizens and also help in making informed decisions thereby building a stronger economy"
The Gomoa Central DCE encouraged Tertiary Education Institutions to do things differently adding " a good attitude towards everything we put into our hearts to do. As John Maxwell affirms, is the primary force that will determine whether we succeed or fail. Our attitude and action in life help determine what happens to us. Again, Private Tertiary Institutions can introduce seminar courses in entrepreneurship that will nature and empower students to develop their productive capabilities and create jobs to address the unemployment menace. More so, Private Tertiary Institutions can collaborate with the private sector such that before students complete their courses of study, they could be easily absorbed into their labor system hence reducing graduate unemployment"
Hon. 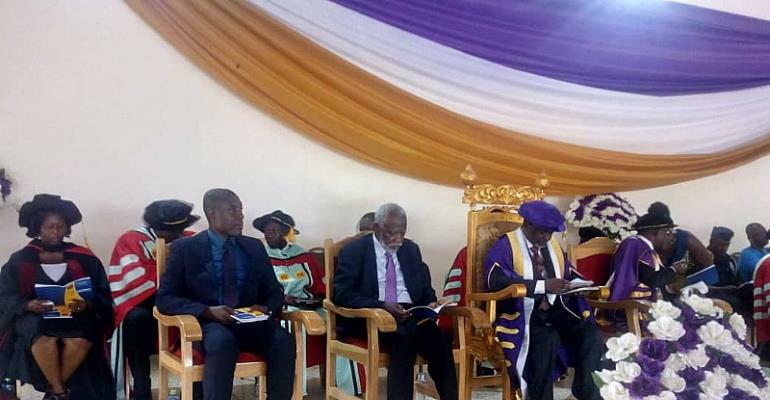 Benjamin Kojo Otoo advised the graduands to work with utmost integrity and sincerity.
" You've been given enough knowledge to transform our society and Ghana. All that you need to do is to do your best. Let me emphasise the importance, reward and indeed responsibility of using your unique talents and energy to make an impact on your community. In conclusion, I will like to appeal to management of Private Universities in Ghana to make their fees affordable to the ordinary Ghanaian so that as many as they want to access their courses can do so"
The students graduated from their various courses of study ranging from Bachelor of Accounting, Banking and Finance, Human Resource Management, and Marketing. Others also graduated from School of Theology and Perez Ministerial College and were awarded with Diploma and Certificate respectively. Chancellor's Award for Overall Best Student went to Mr. Nehemiah Saman while Miss Ononenyi Juliet Adaolisa received award for being Best Student in Accounting. In attendance were Chancellor of Perez University College, Most Rev. Dr. Charles Agyinasare, Prof. Stephen Adei, former Director General and Rector of Ghana Institute of Management and Public Administration (GIMPA) and Hon. Kweku Nyarko Koomson, Presiding Member for Gomoa Central District Assembly.